The sun wakes late. Flowers wilt; the grass is still. Animals gather and store. The wind blows a chill. Unpicked fruit whithers and dies; the ground begins a freezin'. Birds commence their journey south, signifying the Fall season. 'Tis not death of spring these signs are showing. For life is still within us growing. the work of man; his sickles thrust. 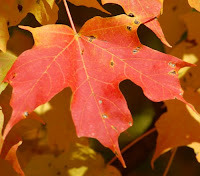 Fall indicates the breath of life and of new birth. Apples and pumpkins and colors of the earth. A time of change; A time to pause. A time to reflect the greater cause. and cold winds the earth entraps. We snuggle closer; we yearn for warming. Rekindling love and new ones forming. to others who need a friendly glow. A season of thanks, a season of giving. A season of sharing, and a season of living. COPYRIGHT 2008. Emma C Miller. Any reproduction of this work may not be made without express written consent of the author. Thanks for visiting Canada. Have a great week!